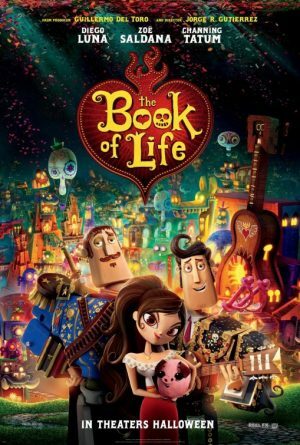 A visually stunning animated adventure produced by Guillermo Del Toro (Pan’s Labyrinth, Pacific Rim), The Book Of Life is just that – a story of life, love, betrayal and death. And it’s fun, too. In a small Mexico town, little boys Manolo and Joaquin vie for the heart of their friend Maria. Their rivalry is watched over by the rulers of the two kingdoms of the dead, beautiful La Muerte (Kate del Castillo) and conniving Xibalba (Ron Perlman) and they make a wager over which of the boys will eventually win Maria’s heart, with the fate of the underworld as the stake. Fast forward a few years and sweet, sensitive Manolo (Luna) is a bullfighter who would rather be a musician, while Joaquin (Tatum) is the town hero thanks to a secret badge he wears that protects him. As Maria (Saldana) decides which man should be her love, the love story takes an unexpected journey to the afterlife when one of the suitors has to travel to the kingdoms of the dead in order to save his heart and the town. As you’d expect from a movie partially set in the afterlife, this has a Gothic feel to it that is perfect for a creepy winter’s night viewing (it’s set during the Mexican Day of the Dead festival, Dia de Muertos). The animation is inventive and vibrant, and while the folk story is somewhat predictable, it is told with passion and charm, and there are some nice little quirky moments (Manolo serenading his love with Radiohead’s Creep, for one) sprinkled throughout this colourful tale. Although this has a U certificate, very young viewers (under 7) may be scared by the ghosts, and visions of the underworld that are throughout the movie. They may also find Xibalba scary.